The youngest of four children, Blanche M. Lambert was born in Helena, Arkansas, on September 30, 1960, to Jordan Lambert, Jr., and Martha Kelly Lambert. The Lamberts were sixth–generation farmers of cotton, rice, wheat, and soybeans. After attending public school, Lambert graduated with a B.S. in biology from Randolph–Macon Women’s College, in Lynchburg, Virginia, in 1982. In 1983, Lambert went to Washington, D.C., where she worked as a staff assistant for Arkansas Democratic Congressman Bill Alexander. From 1985 until 1991, she worked for lobbying firms as a researcher. 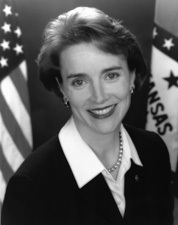 In 1992, Lambert challenged her old boss, Representative Alexander, for the Democratic nomination in his rural northeast Arkansas district, which included farmland along the Mississippi River as well as the city of Jonesboro.4 She ran on a lean budget, traveling the sprawling district in a pick–up truck and using connections to local chapters of Business and Professional Women as a campaign base.5 Lambert prevailed in the primary with 61 percent of the vote, carrying all but two of the district’s 25 counties. In the general election, she defeated a Republican real estate developer with 70 percent of the vote.6 In 1993, Blanche Lambert married Steve Lincoln, a pediatrician. In 1994, she was re–elected to a second term. When Lincoln joined the 103rd Congress (1993–1995), she secured a seat on the influential Energy and Commerce Committee over the preference of the committee chairman, whom she soon impressed.7 She also was assigned to the Agriculture Committee and was appointed to the coveted Democratic Steering and Policy Committee, the party leadership body that makes committee assignments. She advocated for affordable health care coverage for farmers and the self–employed. On fiscal matters she was more conservative, voting for the Penny–Kasich plan to cut federal spending and, in her second term, approving a balanced budget constitutional amendment. Lincoln also voted for the North American Free Trade Agreement in 1993 and the General Agreement on Trade and Tariffs in 1994. In January 1996, she announced her decision not to seek re–election in the House after learning she was pregnant with twins.8 After the boys, Reece and Bennett, were born that summer, Lincoln served out the remainder of her term and returned to Arkansas. When incumbent Senator Dale Bumpers announced his retirement in 1998, Lincoln won the Democratic nomination in a four–way primary to succeed him.9 Her general election opponent was a tax reform and anti–abortion conservative from the Arkansas state senate. Lincoln, who supported women’s reproductive choice, ran on her credentials as a mother and pledged to support women’s and children’s health issues in the Senate.10 She prevailed with 55 percent of the vote. In 2004, Lincoln was re–elected with 56 percent of the vote over a Republican state senator.11 Her three committee assignments in the 106th Congress (1999–2001) included Energy and Natural Resources; Agriculture, Nutrition, and Forestry; and the Special Committee on Aging. In 2000, she co–authored Nine and Counting, a book by and about the women of the Senate. In the 107th Congress (2001–2003), she left Energy and Natural Resources to join the Finance Committee (she was only the third woman in that panel’s history) and the Select Committee on Ethics. As a cofounder of the Senate New Democrat Coalition, Lincoln maintained her profile as a moderate, voting for the 2001 tax cut but against other proposals made by the George W. Bush administration, such as drilling for oil on Alaska’s North Slope.12 She focused on agricultural issues affecting Arkansas farmers, sponsoring legislation related to flooding and crop insurance. In the 106th Congress, she joined the World Trade Organization Caucus and tried to open Cuban markets to Arkansas rice farmers. In the 107th Congress she wrote a bill providing for tax credits to spur the development of biodiesel fuel made from soybeans. In December 2000, Lincoln successfully shepherded through the Senate the Delta Regional Authority, a centralized agency to foster economic development in the lower Mississippi Delta region.13 During the 109th Congress (2005–2007), Lincoln continued to advocate for the development of alternative energy sources. And during the 110th Congress (2007–2009), Lincoln introduced legislation investing in after–school programs and child care. 1Congressional Record, Senate, 111th Cong., 2nd sess. (9 September 2009): S9189; Senate Resolution 257 (9 September 2009). 2Almanac of American Politics, 2002 (Washington, D.C.: National Journal Inc., 2001): 127–129. 3Bill Hewitt, Robin Reid, and Gabrielle Cosgriff, “The Long Shot: Freshman Sen. Blanche Lincoln, 41, of Arkansas Excels at the Nitty–Gritty of Politics—and Motherhood,” 11 March 2002, People: 129. 4Melinda Henneberger, “No Escaping Motherhood on the Campaign Trail,” 13 June 1998, New York Times: A1; “Blanche Lambert Lincoln,” Associated Press Candidate Biographies, 1996. 5Joan I. Duffy, “Pressure Would Follow Lambert to Congress,” 10 October 1992, Memphis Commercial Appeal: A1. 6“Election Statistics, 1920 to Present,” http://clerk.house.gov/members/electionInfo/elections.html. 7Politics in America, 1996 (Washington, D.C.: Congressional Quarterly Inc., 1995): 67. 8Barbara Mikulski et al., Nine and Counting: The Women of the Senate (New York: Morrow, 2000): 92. 10“Blanche Lincoln,” Associated Press Candidate Biographies, 2000; see also Current Biography, 2002 (New York: H.W. Wilson and Company, 2002): 332–334. 12Almanac of American Politics, 2004 (Washington, D.C.: National Journal Inc., 2003): 132–134. 13“Official Biography of Blanche Lincoln,” http://lincoln.senate.gov/biography.htm (accessed 6 December 2004); Congressional Record, House, 103rd Cong., 2nd sess. (15 April 1994): 686. 14Carl Hulse, “Senator Cements Role at Heart of Debate,” 22 November 2009, New York Times: A28; David M. Herszenhorn, “Bill Passed in Senate Broadly Expands Oversight of Wall St.,” 21 May 2010, New York Times: A1. 15Jill Zeman Bleed, “Ark. Sen. Lincoln new head of Senate ag committee,” 10 September 2009, the Associated Press. 16Mary Bruce, “Coming Soon? Healthier School Lunches,” 9 August 2010, http://abcnews.go.com/Politics/healthier–school–lunches–senate–approves–45–billion–bill/story?id=11345256#.T3NiJ9XkZ8E (accessed 28 March 2012). 17Shaila Dewan, “Arkansas’s Senator in Middle, Hit on All Sides,” 8 March 2010, New York Times: A1. 18Arkansas Secretary of State, “Statewide Results by Contest – 2010 Preferential Primary Election & Non Partisan Judicial General Election,” http://www.sos.arkansas.gov/electionresults/index.php?ac:show:contest_statewide=1&elecid=211&contestid=3 (accessed 29 March 2012). 19Arkansas Secretary of State, “Statewide Results by Contest – 2010 General Primary (Runoff) Election,” http://www.sos.arkansas.gov/electionresults/index.php?ac:show:contest_statewide=1&elecid=221&contestid=4 (accessed 29 March 2012); Shaila Dewan, “In Arkansas, Battle Over, It Is Time for Another,” 10 June 2010, New York Times: A24. 21Arkansas Secretary of State, “Statewide Results by Contest – 2010 General election & Non Partisan Judicial Runoff Election,” http://www.sos.arkansas.gov/electionresults/index.php?ac:show:contest_statewide=1&elecid=231&contestid=18 (accessed 29 March 2012). 22Congressional Record, Senate, 111th Cong., 2nd sess. (15 December 2010): S10263. 23Kris Kitto, “Life after Congress,” 23 June 2011, Roll Call: 22. Papers: 1993-1997. 33 feet Congressional papers and correspondence, including photographs, video tape, and sound recordings. Papers: ca. 1998-2011. ca 400 linear feet. Senatorial papers, memorabilia, and electronic records. "Blanche Lambert Lincoln," in Women in Congress, 1917-2006. Prepared under the direction of the Committee on House Administration by the Office of History & Preservation, U.S. House of Representatives. Washington, D.C.: Government Printing Office, 2006. U.S. Congress. Tributes Delivered in Congress: Blanche L. Lincoln, United States Congressman, 1993-1997, United States Senator, 1999-2011. Washington: U.S. Government Printing Office, 2012.